Have you ever had a personal loan from a friend or co-worker? It’s a situation a lot of people have been in, and it has the potential to destroy relationships. 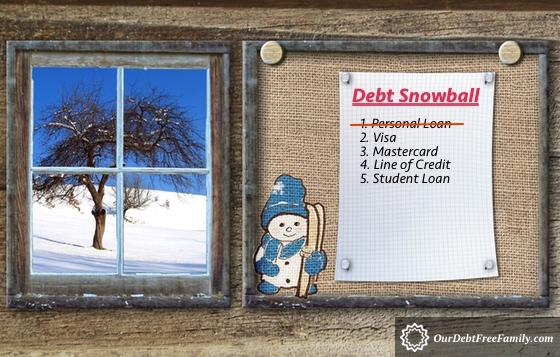 So if you owe a friend or family member money, where should you prioritize that loan in your debt snowball? Hi! I love your site and your advice! I just worked some things out with my credit card company so that’s a plus. Where would you put, in order of importance on the snowball list, owing money to people? Thanks so much! I’m so glad you’ve found the site helpful! That’s a great question, and I know that a lot of people are in the same situation. I love that you are thinking this through when creating your debt payoff plan because not all debts are created equal. I’m going to assume you’re referring to owing money on a personal loan to a friend or family member, as opposed to an institution. I’ve definitely been there, and my first thought is to put this at the top of the list because owing money to friends or family can strain your relationship. But an exception to this might be if the loan balance is a larger amount. For example, I once owed $200 to a friend. She loaned me the money to help me fly to California to attend another good friend’s wedding. It was super sweet of her to offer, and at the time, I didn’t think I had any other option to quickly come up with the money. I made it my goal to pay her back as quickly as possible because I didn’t want to damage our friendship and put doubts in her mind about lending me the money. I used whatever funds I had available from my next couple of paychecks to pay her back. And if I remember correctly, I even put some payments to other debts on hold so that I could pay her back even quicker. Even though doing so would damage my credit score, I cared more about not damaging my friendship and the trust she had placed in me. During that time, I was struggling to get current on my other debts so I did not prioritize paying back this loan first. We had a written agreement that spelled out the loan term and the payment amount so I knew her expectations for payment. So I guess the short answer is — it depends. I would consider what was agreed upon when the loan was made. If the timeframe for payment was left up in the air, then I would try to pay him/her back as soon as possible. The amount could be a factor, too, though. If it’s more than you could feasibly pay back within a couple of paychecks, then find out what timeframe would work for them. Either way, I would ask him/her when they’re expecting payment and how much. Get really clear on payment arrangements and timeframes and put it in writing. This will hopefully reduce any tension that may be building if they haven’t received any sort of payment yet or any communication about when a payment might be made. Then do your best to stick with the payment arrangements, and be sure to communicate if there’s ever a time when you’re going to be late with a payment. I hope that helps! Please let me know how it goes. Now I’d love to hear about you, dear blog reader! 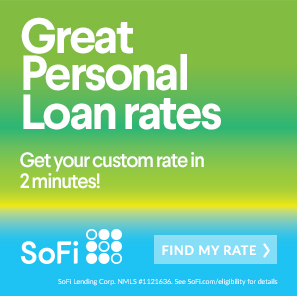 Have you ever had a personal loan or have you ever made a loan to a friend or family member? How did it turn out? Please share in the comments below. 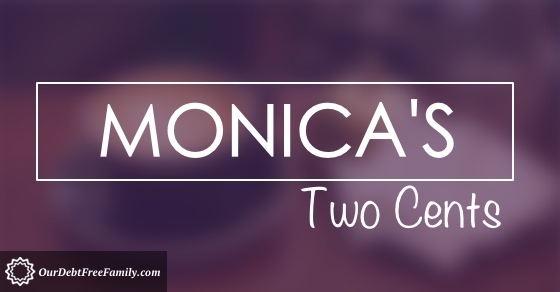 Also, I love answering your questions so if you have a question, please don’t hesitate to email me on the Contact page, and your question just might be featured on a future edition of Monica’s Two Cents! I once loaned a friend a very large amount of money. To make a long story short I ended losing some of that money and a friendship. Now I no longer loan money or would co-sign for anyone no matter what the situation. We don’t loan money either. Instead, if we have a friend or family member in need, we’ll give them money as a gift with no expectations of repayment. It keeps things simpler that way. Based on past experience, my rule with family and friends, is to never lend money that I am not prepared to lose. That said, in terms of repayment, would always be flexible and lenient with expectation that they make some payment monthly but that they focus on paying back higher interest/crippling debt like bank and student loans. I think that’s a good rule in general — never loan money you’re not prepared to lose. Thanks for your feedback, Ursula! Personal loans are just so tricky. I don’t loan money to people–I may give it to them as a gift, but I won’t loan. It just adds an element to the relationship that I don’t like. I agree, Melinda. We’ll only give money as a gift to those in need. I agree. It’s not a good feeling to owe a friend money. Have had BAD past experiences with financially helping out friends. It is definitely not something we would rush into ever again. I’m with you, Brian. I think I would rather give to friends in need than expect a return payment. Ha! I like that philosophy, Marlynn! I hate owing money to friends! Great answer, it does depend! Thank you! It didn’t feel good to owe my friend money way back when. I knew how I handled the situation would impact the relationship so that’s why I paid her back as quickly as I could. I am ashamed to say that years ago I ruined a great friendship with someone I borrowed money from because I didn’t repay them in a timely manner. In my young mind I figured, “Oh, they’re a friend, they won’t mind if I pay them later.” She minded…and rightfully so. I have never borrowed money from a friend since then, though I will lend money to friends with clear expectations on repayment. Setting clear expectations is the best way to handle the situation for sure! It’s great to make a plan up front and be open with the person who loaned the money. Great write up! Yes! Ensuring all parties are on the same page is so important. I’ve never seen this question addressed- glad you did so here! Thanks, Catherine! Glad you liked the post! It’s really critical that people realize the power of a personal debt in a relationship. Not saying it is likely to be ruined by any means, but the minute the transfer of funds occurs, it shifts the relationship a bit. I know from experience. Just like you said, Monica, the sooner that loan gets paid back, the better. I totally agree, Laura! It does shift the relationship a bit.